Vivek Wadhwa, a technology expert and professor at Carnegie Mellon University, addressed last week’s NIC Fall Conference in Chicago on what the future holds. 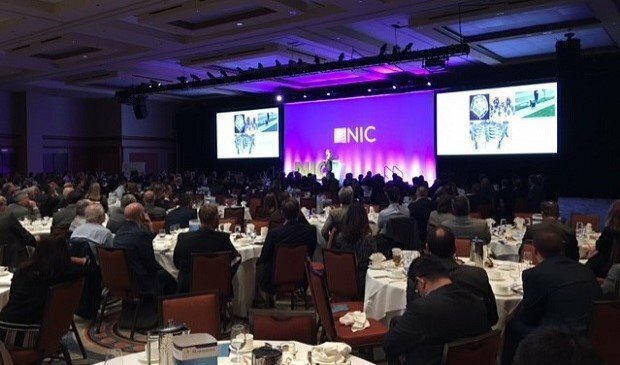 CHICAGO—In the midst of several days devoted to analyzing what’s currently happening in the seniors housing industry, more than three thousand attendees at last week’s National Investment Center’s Fall Conference also got a glimpse of the future. “Every industry is about to be disrupted,” Vivek Wadhwa, fellow and professor at Carnegie Mellon University’s College of Engineering, said at the main conference luncheon. He proceeded to break down how the technology that brought us smart phones and big data has only begun transforming the real estate industry. Wadhwa started by playing clips of the Apollo 11 moon landing, and asked attendees whether they knew how much computing power the astronauts’ guidance system had. It turns out to be the equal of a modern-day musical greeting card. It’s just one example of how computing power has grown at an exponential pace ever since men walked on the moon. And that progress shows no sign of slowing down. “We don’t seem to comprehend what exponential means,” he added. But by 2023, an ordinary hand-held device will have the power of a human brain, and by 2050, one will have the power of all human brains in existence combined. That stupendous growth will occur in artificial intelligence, robotics, nanotechnology, and many other fields. That means the real estate industry will change in ways difficult to imagine. Wadhwa did bring up a few examples which show where health care may go. Most aspects of the business seem destined to get cheaper and quicker. The typical health care cycle, in which a patient over roughly five days sees a doctor at a medical office building, takes tests, waits for the results and then gets a prescription or receives other care, will probably soon end. But the relentless advance of computing power means that by 2025, anyone who wants and can afford a Rosie will have one. “And she will be dropped off at your house by Amazon.” In ten years, robots that can thread a needle and be dexterous enough to do surgery are also likely. The implications are rather staggering. A wide range of activities will be completely transformed. “We’re going to be sitting back and letting the cars do the driving,” Wadhwa said, and 3-D printers will have the ability to create whole houses.